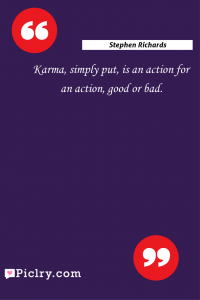 Meaning of Karma, simply put, is an action for an action, good or bad. Quote by Stephen Richards. Meaning of No need for revenge. Just sit back and wait. 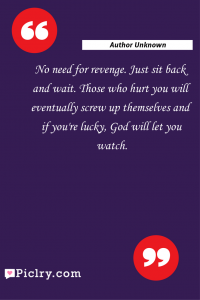 Those who hurt you will eventually screw up themselves and if you’re lucky, God will let you watch. Quote by Author Unknown. Meaning of Every action has equal and opposite reaction. This is law of the universe and spares none. Wrong done and injustice inflicted is paid back in the same coin. No one has escaped justice of the universe. It is only a matter of time. Quote by Anil Sinha. Meaning of Nobody deserves misery but sometimes it’s just your turn. Quote by Author Unknown. Meaning of I believe in Karma. If the good is sown, the good is collected. When positive things are made, that returns well. Quote by Yannick Noah. Meaning of Realize that everything connectsto everything else. Quote by Leonardo DaVinci.